After the Battles of Lexington and Concord near Boston in April 1775, the colonies went to war. Washington appeared at the Second Continental Congress in a military uniform, signaling that he was prepared for war. 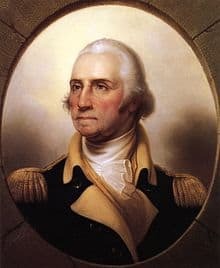 Washington had the prestige, military experience, charisma and military bearing of a military leader and was known as a strong patriot. Virginia, the largest colony, deserved recognition, and New England—where the fighting began—realized it needed Southern support. Washington did not explicitly seek the office of commander and said that he was not equal to it, but there was no serious competition. 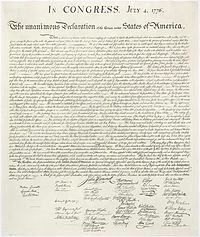 Congress created the Continental Army on June 14, 1775. Nominated by John Adams of Massachusetts, Washington was then appointed General and Commander-in-chief. Washington had three roles during the war. In 1775–77, and again in 1781 he led his men against the main British forces. Although he lost many of his battles, he never surrendered his army during the war, and he continued to fight the British relentlessly until the war’s end. He plotted the overall strategy of the war, in cooperation with Congress. Second, he was charged with organizing and training the army. He recruited regulars and assigned Baron and General Friedrich von Steuben, a veteran of the Prussian general staff, to train them. The war effort and getting supplies to the troops were under the purview of Congress, but Washington pressured the Congress to provide the essentials. In June 1776, Congress’ first attempt at running the war effort was established with the committee known as “Board of War and Ordnance”, succeeded by the Board of War in July 1777, a committee which eventually included members of the military. The command structure of the armed forces was a hodgepodge of Congressional appointees (and Congress sometimes made those appointments without Washington’s input) with state-appointments filling the lower ranks and of all of the militia-officers. The results of his general staff were mixed, as some of his favorites (like John Sullivan) never mastered the art of command. Eventually, he found capable officers, such as General Nathanael Greene, General Daniel Morgan, “the old wagoner”, with whom he had served in The French and Indian War, Henry Knox, his chief of artillery, and his chief-of-staff Alexander Hamilton. The American officers never equaled their opponents in tactics and maneuver, and consequently they lost most of the pitched battles. The great successes, at Boston (1776), Saratoga (1777) and Yorktown (1781), came from trapping the British far from base with much larger numbers of troops. Daniel Morgan’s annihilation of Banastre Tarleton’s legion of dragoons at Cowpens in February of 1781, came as a result of Morgan’s employment of superior line tactics against his British opponent, resulting in one of the very few double envelopments in military history, another being Hannibal’s defeat of the Romans at Cannae in 216 b.c. The decisive defeat of Col. Patrick Ferguson’s Tory Regiment at King’s Mountain demonstrated the superiority of the riflery of American “over mountain men” over British-trained troops armed with musket and bayonet. These “over-mountain men” were led by a variety of elected officers, including the 6’6″ William Campbell who had become one of Washington’s officers by the time of Yorktown. 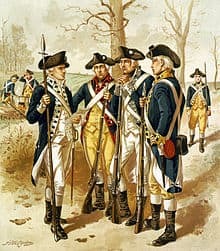 Similarly, Morgan’s Virginia riflemen proved themselves superior to the British at Saratoga, a post-revolutionary war development being the creation of trained “rifle battalions” in the European armies. Third, and most important, Washington was the embodiment of armed resistance to the Crown—the representative man of the Revolution. His long-term strategy was to maintain an army in the field at all times, and eventually this strategy worked. His enormous personal and political stature and his political skills kept Congress, the army, the French, the militias, and the states all pointed toward a common goal. Furthermore, by voluntarily resigning his commission and disbanding his army when the war was won (rather than declaring himself monarch! ), he permanently established the principle of civilian supremacy in military affairs. Yet his constant reiteration of the point that well-disciplined professional soldiers counted for twice as much as erratic militias (clearly demonstrated in the rout at Camden, where only the Maryland and Delaware Continentals under Baron DeKalb held firm, helped overcome the ideological distrust of a standing army.